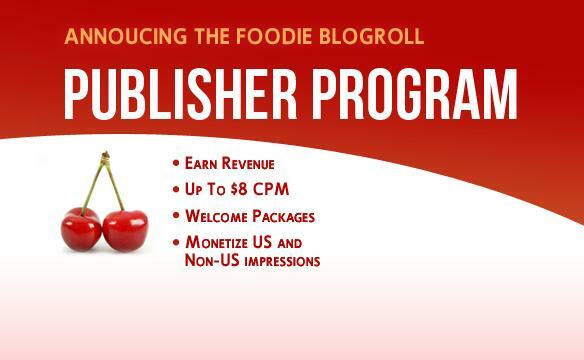 Foodie Blogroll is announcing the launch of Foodie Blogroll Publishing Program, this allows and help members earn through their foodblogs and serves as alternative to ad networks. For food bloggers out there you are invited to join the Publisher Program. Free to do product reviews for food companies – Our publishers are free to run their own giveaways or reviews on their blog by working directly with food companies. For example, if POM Wonderful invited you to an event or to review one of their products directly, we would be excited for you, not hinder you. Free to work with affiliate programs – You can continue working with Amazon, Williams-Sonoma, etc. Free to display text link ads – You can continue displaying text link ads from whatever source. Login to your Foodie Blogroll Account – go to: http://www.foodieblogroll.com/login/ and use your login details. You will see a list of your blogs currently in the Foodie Blogroll. Find the blog you’d like to submit to the program in the list and check the box next to its title. Check the box to accept the program terms. Note: All Publisher Program submissions are reviewed individually and it may take some time (up to 2 weeks) to get to yours.